What I have come to enjoy most and perhaps appreciate even more about living and working overseas is the opportunity to meet different people from all walks of life. Whether it’s the colleagues I teach with, the students in my classes, or the people I meet living and working in Korea, without question over the years I have met many interesting and colorful people. At the same time, the personal and professional relationships which I have cultivated and fostered for as long as I have been in Korea have in many ways defined who I am, not to mention make my own life more interesting. This past weekend, a former colleague of mine, Kyle Devlin, who is in Korea for a couple of weeks, stopped by for a few hours. We haven’t seen each other since last June when he left Korea to go to Indonesia to teach. Even though we have kept in touch through email the past year, it was really nice to spend a few hours catching up on each other’s lives. Kyle is like many of the English instructors I have met since I first came to Korea. Even though we all come from various parts of the world with different backgrounds and even different likes and dislikes when it comes to music or our favorite brand of beer, once in Korea we all share the same common denominator of being an expatriate. Whether you just talk when you are at work, hang out after work for a few beers at our local watering hole, or perhaps even do some traveling, as expats in Korea we all have that one thing in common while we are living and working here. Even though there are probably some people that I would have never hung out with back in the United States, once in Korea we have become very tight and have fostered friendships that in many ways are richer than some of the ones I have had with friends back home. That’s just the very nature of the whole expat experience of bonding with each other and dealing with things that most people back home would have a difficult time comprehending. To be sure, once you have lived and worked overseas for any length of time, it’s often hard to try and describe what it is like being an expat to the friends you used to hang out with when you were growing up. Try explaining something like language problems or cultural differences that we sometimes have to deal with on a daily basis here. On the other hand, the friendships you make overseas, at least to me, seem more enduring and no matter if those friends leave Korea, you will always share that same common denominator of having lived and worked here. There is always someone you have worked with in Korea who will know what you are talking about. Although Kyle and I were not the closest of friends the first year that he was here, by the time he left Korea last year we were pretty tight. Other than going out for the occasional beer after work with other colleagues, having similar interests in sports and movies, what really made us tight in the end was the friendship which grew out of our professional relationship. One of the things that I missed most when he left was how each morning we would catch up on the news from around the world before we started teaching. I honestly believe that when you live overseas you tend to follow the news more closely and in many ways have a clearer perspective of things when you get your news from a variety of news sources on the Internet. (I sometimes feel that these days I am better informed living overseas than I am whenever I spend any time at home.) Every morning, without fail Kyle and I would discuss what was happening either here in Korea or around the world bouncing our own opinions off each other for good measure. It goes without saying that there is something universal which all expats share with each other when they work and live together. If it’s not talking about the latest news or sports scores, it’s talking about our lives here in general. No matter how far we tend to immerse ourselves in our own work and life pursuits, the friends we make while we are overseas impact our lives in many ways. Sadly, like Kyle and many other people I have met while I have been in Korea, once they leave it’s often hard to meet up with them again. Even though email and an occasional phone call keep us in touch, for many people we meet, we may never see them again. Nonetheless, we will always be a part of each other’s lives no matter where we go. As for all the colleagues I have gotten to know while in Korea, I have been grateful not only for their friendships, but also for their professional and personal advice which has helped me countless times over the years. The people I have met and worked with over the years have enriched my life and have made my life complete. I would not be the person I am today if it hadn’t been for the people I have been fortunate enough to meet along the way. It’s 10:30 on a Tuesday night in late June in Bangkok and I am waiting for Jimmy Wong to arrive at his tattoo shop in Bangkok. I’ve been coming to Jimmy Wong’s tattoo shop quite regularly (which means every time I am in Bangkok) ever since I first stumbled across his shop by accident in 2004. Back then I was thinking about getting a tattoo when I was in Bangkok (I already had plans to get one in Phuket) and when I spotted his sign outside his shop on Sukhumvit Soi 5 (I was staying at the Bel Aire Princess at the end of the soi) I stopped to take a look. Jimmy’s tattoo shop which is located behind a 7-11, just off Soi 5 is like most of the tattoo shops that I have seen in Bangkok—very small and crowded. He’s had a couple of shops in Bangkok before moving to this present location which is pretty easy to find. One night back in 2004 when I was getting one of my first tattoos from Jimmy a man from France stopped in. He wasn’t interested in getting a tattoo; he just stopped in to pick up one of Jimmy’s business cards for a friend back home who had heard of Jimmy. Turns out, this friend back in France had heard that Jimmy had once tattooed legendary punk rock icon Johnny Thunders and wanted one of Jimmy’s business cards. When I am getting more work done by Jimmy I usually get to his shop right around 10:00. If Jimmy hasn’t arrived at his shop yet, I usually hang out at this small coffee shop near the entrance to his shop. He usually gets to his shop between 10:00-10:30 on most nights. Most of the time he already has an appointment or two lined up for the evening. In my case, I usually book a few nights the first night I get into Bangkok. Tonight Jimmy was running a little late. I order a café latte at the coffee shop and sit near the front so I have a view of the street as I wait for Jimmy to arrive. There’s a steady flow of people walking up and down the street on their way to this sports bar across the street or the 7-11. I am about halfway through my latte when I spot Jimmy walking down the sidewalk. Jimmy sees me immediately and waves as he continues toward his shop. By the time I get to his shop a few minutes later, Jimmy is already at work preparing his machines and ink for this session. His workspace is a bit cluttered with designs of tattoos he has done or will do hung up around his desk; some taped to a desk lamp over the desk. One of the first things Jimmy does when he comes to work is make himself a cup of coffee, light up a cigarette and then get his machines ready for the evening. Of all the times I have been there no one has ever walked in and gotten a tattoo without an appointment. Although he has a large sign out in front, he doesn’t seem to get a lot of people walking off the street to get a tattoo. From time to time there might be someone “who is thinking about getting a tattoo’’ after a night of drinking and checking out some of Bangkok’s steamy nightlife, but Jimmy usually sends them on their way. After tattooing for as long as he has Jimmy can easily spot someone who is really interested in getting a tattoo or not. While Jimmy is carefully doing the outline of this tattoo on my arm we talk about my vacation in Thailand this time and when I will be back here again in September. Jimmy loves to talk when he’s doing a tattoo and the stories that he tells are fascinating especially those about some of the tattoos he has done and the people he has met over the years. It’s no wonder that he is a legend. Of course Jimmy would probably disagree. He’s just happy to be doing what he his has dedicated his entire life to. On this night I am in the chair for a little over three hours. Tonight Jimmy started working on what is going to be a Thai mermaid from the Ramakien (you can also see similar images in Wat Phra Kaeo). These kinds of tattoos are one of Jimmy’s specialties and you are not going to find many tattoo artists doing similar tattoos of the same quality that only Jimmy can do. We’ve decided on a couple of tattoos from the Ramakien on my chest; the Ramakien-style tattoos inside my right arm (and later my left arm) will blend in with the ones that Jimmy will do later. I am surprised that this tattoo on the inside of my right arm does not hurt as much as I thought it would. Then again, Jimmy has a pretty light touch when it comes to the delicate and intricate detail of these tattoos. The coloring will have to wait until I am back here in September. 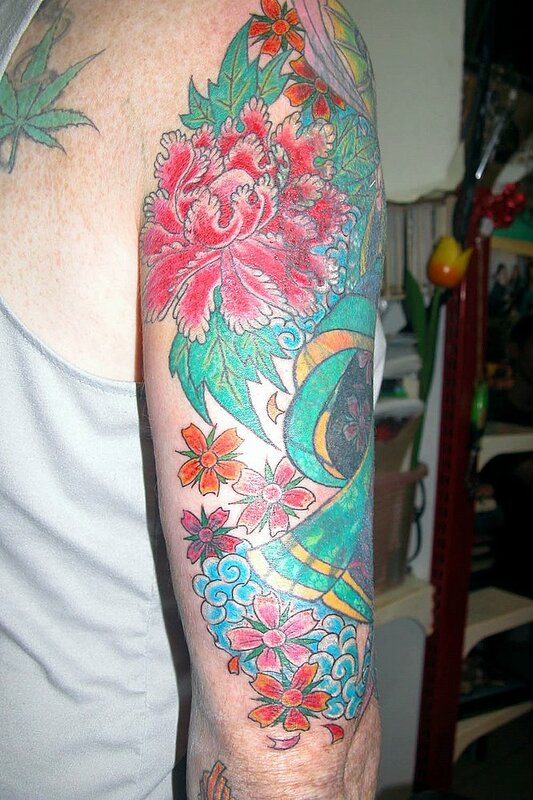 Since Jimmy started working on this arm a year ago, he has done six tattoos, not including the one cover-up of a Geisha. This cover-up is taking a little longer to finish and will probably require one or two more sittings to complete it. I have been traveling to Thailand for years as well as getting tattoos done while I am there and this is the first time that I have stayed at a hotel where there was a “warning” like this left in the room. Obviously, this hotel in Phuket has had problems with some of its guests getting inked and staining the towels and linen. 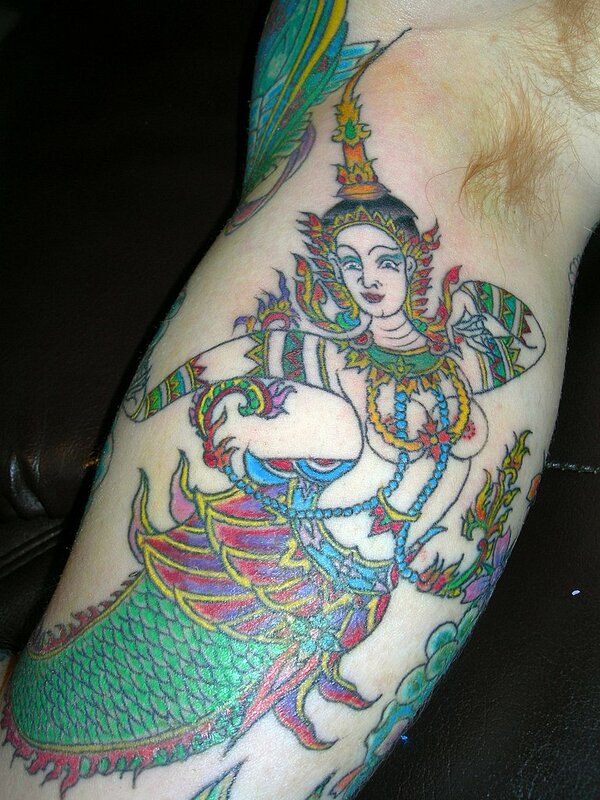 Jimmy finished this cover-up on my right arm this trip to Thailand. He is going to have to add some more color when I am back here again in September. Would You Want to Drink This? I am sure a plum-flavored drink would be very refreshing on a hot day, but I think whoever came up with the name of this product should have given more thought how it would sound in English.